Whale sharks are known to be nomadic, but the recent travels of two tagged whale sharks raises questions about the lifestyle of the world’s largest shark species. 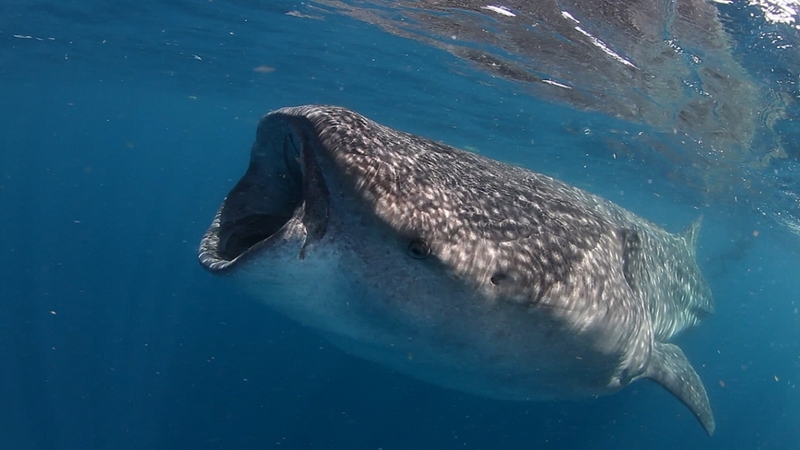 Male whale sharks “Milo” and “Lucho,” tagged last summer near Isla Mujeres, Mexico by marine biologist Rafael de la Parra, director of the Ch’ooj Ajauil AC, have made nomadic journeys of a combined nearly 10,000 miles. But unlike nomads, they have both found that there is no place like home, now swimming in the same place where they were originally tagged nearly eight months ago. Both sharks were tagged with fin mounted satellite SPOT tags in an unprecedented feat – while de la Parra swam with them underwater! This study of whale shark migrations is being undertaken in collaboration with Nova Southeastern University’s (NSU) Guy Harvey Research Institute (GHRI). The ongoing journeys of these and other whale sharks can be followed online in near real-time at www.GHRItracking.org (see Project 18). Milo’s journey is the longer of the two, first swimming east deep into the Atlantic Ocean past Bermuda and returning near the tagging site in February, 2019. Then Milo took a month-long excursion into the Gulf of Mexico, returning close to the tagging site once again, logging more than 7,000 miles. Lucho, on the other hand, has had a shorter voyage. He left in late August on a 2,713-mile swim through the waters surrounding the Cayman Islands, Cuba, Jamaica, Haiti and the Turks and Caicos Islands before turning around and travelling to the coast of Honduras. From there, he made his way home to the tagging site by Isla Mujeres in late December. Three months later, he’s still there. 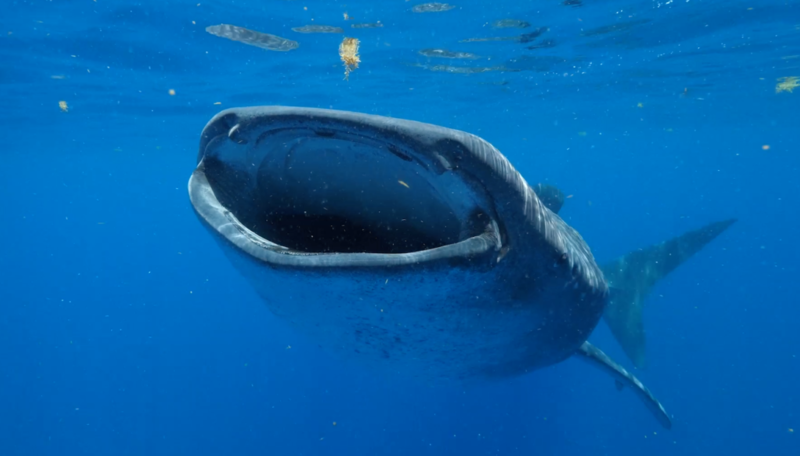 A whale shark study by the GHRI and collaborators from the Maldives Whale Shark Research Programme made news in 2018 when the data showed that whale sharks can live as long as 130 years and may grow as large as 61.7 feet on average (nearly 17 feet longer than a school bus and three times the length of a Great White Shark). More than 150 sharks, including whale sharks, tigers, makos and oceanic whitetips, have been tagged by GHRI in the last decade in order to study the migration patterns of these incredible creatures. “Unfortunately, whale sharks are currently on the endangered species list, so revealing their migration behavior allows us to better understand, conserve, monitor and effectively manage shark populations,” said Greg Jacoski, executive director of the Guy Harvey Ocean Foundation, which is helping fund this research. A new documentary chronicling whale sharks will be released this month by world renowned artist, conservationist and biologist Dr. Guy Harvey. Available on Amazon.com, “This is Their Ocean: Sea of Life” is hosted by Dr. Harvey’s daughter Jessica and follows the thrilling adventures of two students as they swim with whale sharks off the coast of Mexico. About NSU’s Guy Harvey Research Institute: Established in 1999, the Guy Harvey Research Institute (GHRI) is a collaboration between the renowned marine artist, scientist and explorer, Dr. Guy Harvey, and Nova Southeastern University. The mission of NSU’s GHRI is to provide the scientific information necessary to understand, conserve, and effectively manage the world’s marine fishes and their ecosystems. The institute is one of only a handful of private organizations dedicated exclusively to the science-based conservation of marine fish populations and biodiversity. The research, education and outreach activities of NSU’s GHRI are supported by the Guy Harvey Ocean Foundation, AFTCO Inc., extramural research grants, philanthropic donations by private businesses and individuals, and NSU. Please visit http://cnso.nova.edu/ghri for more information.